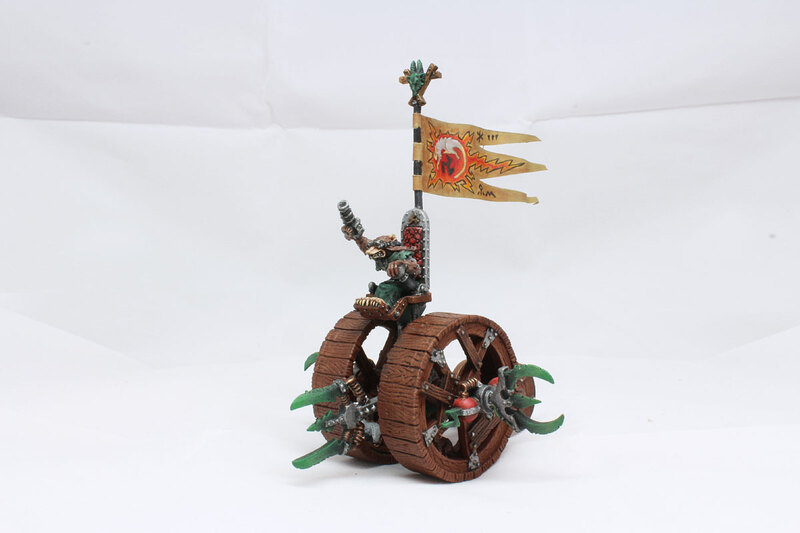 First Doomhweel – old metal model from early 1990s lacked the banner. Everything else was done here – I painted it in September 2014, right before my trip to America, all was left to paint, cut it out and attach the banner to the pole. Oh, wow, to be honest I’m not very good at painting paper banners… of course, it’s like doing the colouring book – all is prepared – all is need to be done, just fill all empty space with colours. But It happened to be not that easy, if you wish it to look nice. 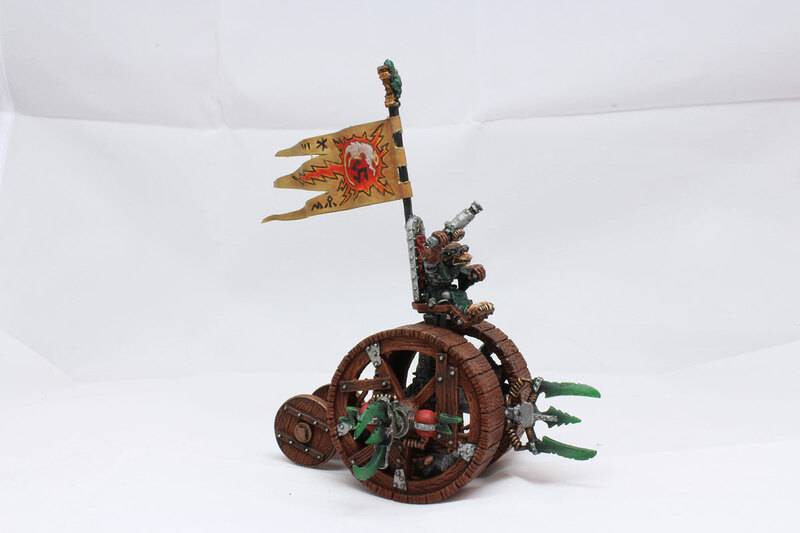 And I’m not doing it quite often these days – all banners in new GW models are made from plastic – and it’s much easier for me to do the plastic banner, but this old Doomwheel was need to be finish at last. 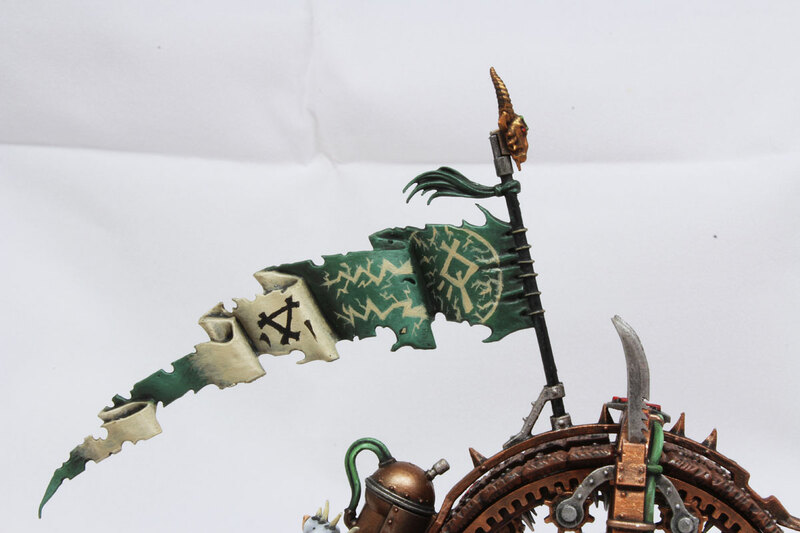 So, I yesterday evening I focused and I forced myself to paint this piece of cloth to hang it on the pole of this awesome miniature. And it’s ready! Of course, still no base – but, in my opinion it looks great even without base. And when the time comes I’ll put it on this square or rectangular base. 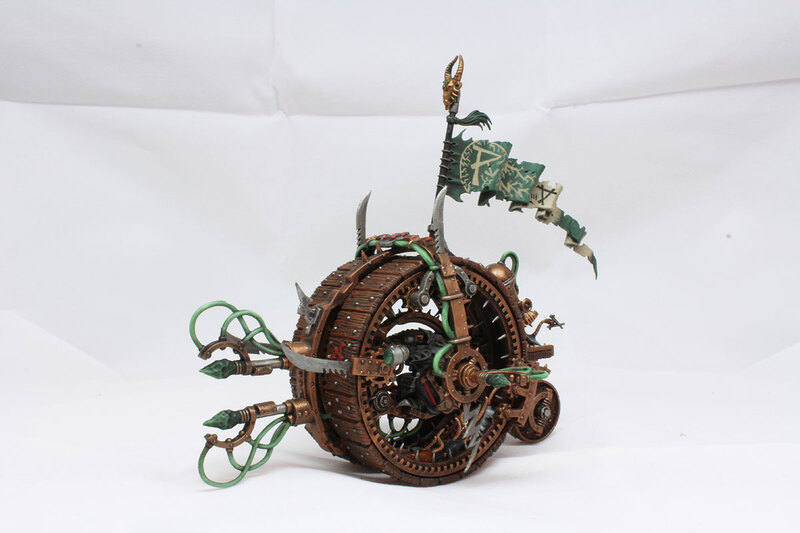 Second Doomwheel – this one is the new model still available in stores. I’ve bought it just few weeks ago, specially for my clash with Empire I had last week. I was thinking – easy peasy – I should finish it in one day. So, I sat down…and I got distracted by …wow, I don’t even remember by who or what. Time passed – and instead of painting the model and after that I decided to clean my desk and arrange my unpainted minis. Another few houres paassed… Imagine that – before the day was over, all I’ve done – cut the pieces of the sprue and prim them. Wow, unbelievable. I had 5 days until the battle and very little time to paint. So, the day before battle I have painted and assembled only most essential parts to put the model on the table – the driver and the wheel (with the rats inside). Nothing more. I told you I was cheating, wasn’t I? ;). Last week I decided to get over with it. I have painting it slowly – for some limited time every day. One day it was 2 hours, and another only 15 minutes (I had really busy last two weeks…), so as you can imagine, there was very little progress. And finally, yesterday and today I forced myself and I completed Doomwheel. There was one big ooops with my work here… I don’t know how I’ve done it – I thought I followed assembly instructions carefully, but no… I actually messed up something. I couldn’t attached front blades – there was no space! Frontal warpstone generators was blocked the space for the blades. I tried not to loose my nerve here – I attached side blades to go up, and in front I just put only two. Somehow – I made to save the day and it looks OK in my opinion. Honestly I do not have idea how I managed to make mistake here. 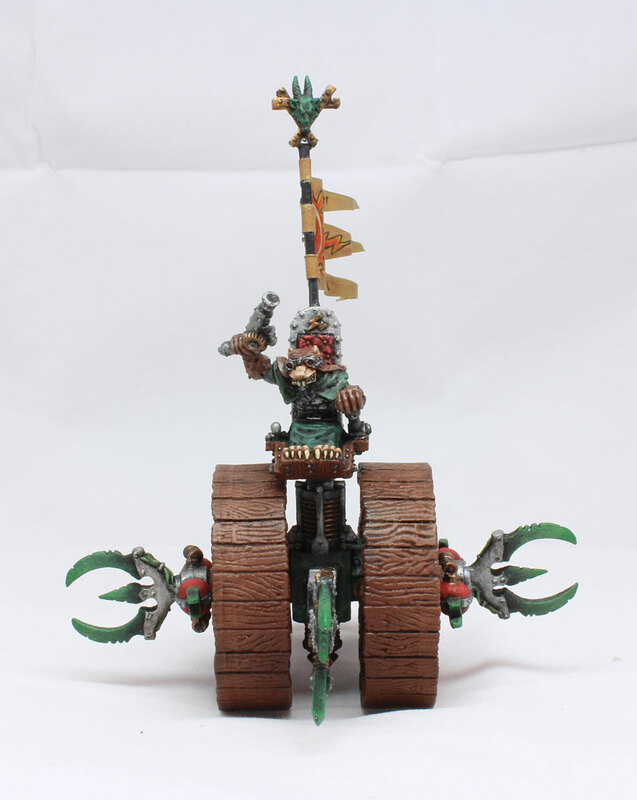 I have one more plastic Doomwheel in my big ‘Skaven’ box – and this time I’ll need to follow instructions with more care. The banner with Clan Skryre Runes. Both models are great. I love vintage look of old Doomwheel. My first Skaven army in 1990s had one ( I haven’t managed to painted though) and I have big sentiment for it, but really the new plastic model is absolutely stunning. I shouldn’t compare these two – but I feel I have to. New model beats the old one – it is way more detailed, and it looks like true Clan Skryre masterpiece. 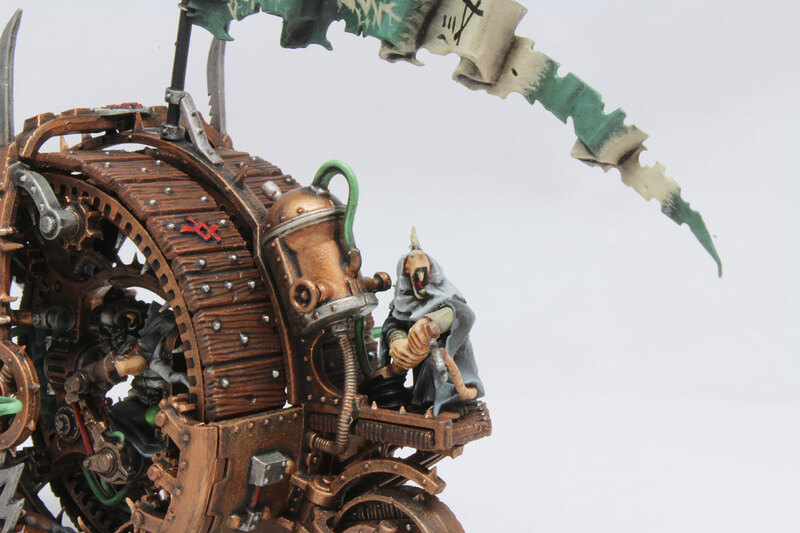 It’s kind of the big, big upgrade of old obsolete model – the brightest Skaven engineers sat down and made the best they can done. Doomwheel perfection. That’s it – this model is perfect! (oh, maybe, assembly instruction should be little bit more for dummies – like myself;). And I love it! Age of Sigmar is for me still terra incognita. I haven’t played the game even once and I haven’t studied the warscrolls carefully. Of course I watched some tutorials and battle reports – and I think the rules could allow nice entertainment. The problem is – I’m not fond of new fluff that much and I really can’t find myself in the world where there’s no balancing ideas – no points, no scenarios, battalions – anything that helps. I hope Games Workshop will bring us some rules for balancing armies soon. And then, I’ll give AoS the shot – and I’ll post my impressions. …so right now, as you can imagine, I’m no expert at the moment to write how Doomwheel could be doing in the battle. The rules seem to be nice – 4+ to hit 4+ to wound for D6 lightings (little bit less threatening than 8th IMO), and 3+ to hit and 3+ to wound in malee (also D6 attacks). The true fun starts with ‘More-more speed’ rule. 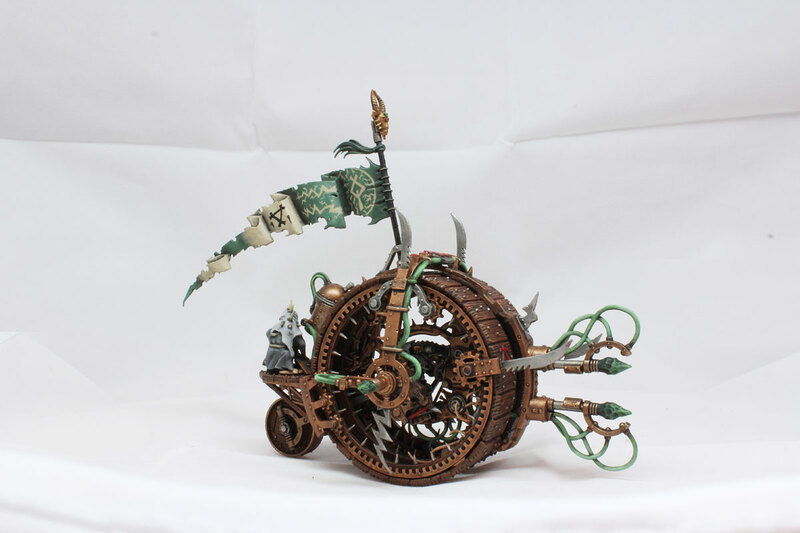 Skaven control can decide to push the poor rats inside the wheel to pick up the pace and the distance Doomwheel moves is doubled (to 4D6!). Great! The only disadvantage is – if you roll double – your opponent is moving the model ( even better! I love Skaven unpredictability). 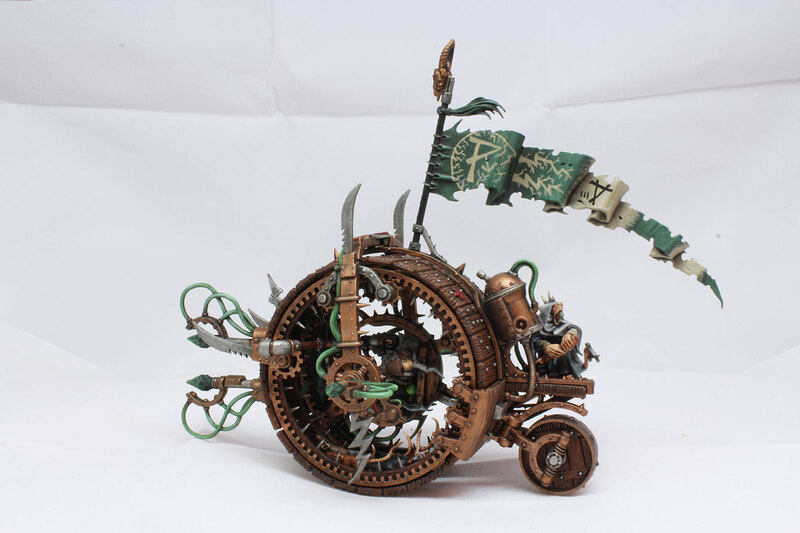 Eventually I’ll play Age of Sigmar someday and see Doomwheel in action. Plans for the future: No really. That’s it. I promise (for real this time) no more Skaven for a while. I need a break from them. I’ve already started to magnetize Blood Angels Terminators and they will be next. Few battles ahead – probably two of 5th edition of Warhammer FB and one or two 8th edition (that’s in upcoming weeks). I also hope I’ll finish my small detachment of Blood Angels to play WH40k before my departure to Australia and Asia in October. It’s doable. And I hope I’ll get some tutorial battles of Infinity and Malifaux any time soon. I’m still at the stage of adapting the rules and I could use some practice. Insane detail GOT! Beautifully painted. wonderful machines – 3 would be better though, there’s no kill like overkill! Man… Your painting is mind blowing. I love the Banner! I thought your banners turned out looking nice, even the paper one. 🙂 Also, you are right — the new doomwheel is a huge step up from the old one, though nostaglia is a powerful thing too.